Probate is the process of determining whether a will is valid and, if it is, paying the deceased person's debts and distributing his or her assets as instructed in the will. In Indiana, a will must be probated in the county where the deceased person lived at the time of his or her death. If the deceased person did not live in Indiana, the will may be probated in the Indiana county where the deceased person had property. File the will with the probate court. This task is the responsibility of the person who has the will at the time the testator -- the person who made the will -- dies. If the person who has the will does not file it with the probate court, the personal representative of the estate or the probate court may order the person who has the will to file it. The personal representative -- also known as the executor -- is the person responsible for carrying out the testator's wishes as written in the will. Petition the court for letters testamentary. Letters testamentary are documents issued by the court that give the personal representative the authority to carry out actions required to pay the deceased person's debts and distribute his or her assets. 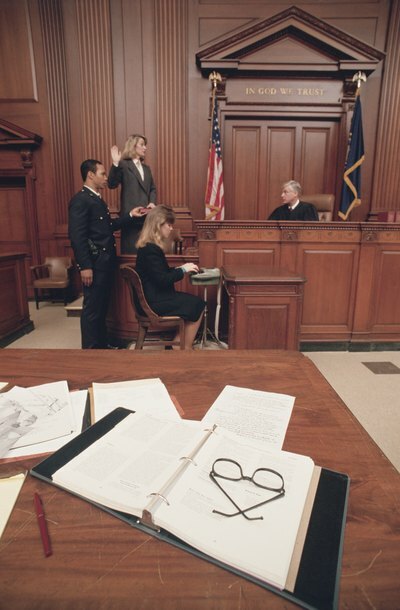 Provide proof of the will's validity to the probate court. Whether or not a petition to probate is filed, Indiana courts will not accept a will for probate if it has not been proven to be the deceased person's will. The will may be proved by at least one of the witnesses to the will testifying. If all the witnesses are dead, incapacitated or have left Indiana, the will may be proven by demonstrating that the signature of the testator or at least one witness matches the handwriting of the person to whom the signature belongs. Find the deceased person's creditors. In Indiana, the personal representative must find and notify the deceased person's creditors of the death within one month after receiving his or her letters testamentary. Indiana law presumes that a personal representative will use reasonable diligence to find the estate's creditors by reviewing the deceased person's financial records. Prepare a written inventory that describes each of the estate's assets and its fair market value. You may hire an appraiser to help you determine the value of certain items in the estate and pay for the appraiser's services with money from the estate. A copy of the inventory should be given to every beneficiary listed in the will. Pay the debts owed by the estate. Debts the personal administrator is expected to pay from the estate include medical, funeral and burial expenses and any outstanding tax bills. Creditors must bring their claims against the estate within three months of being notified of the deceased person's passing or their claims are barred by law. Distribute the remaining assets in the estate to the beneficiaries as instructed in the will. If an asset is perishable or may lose value if neglected -- like real estate -- the personal representative may give it to the beneficiary named in the will before the creditors' three months are up as long as doing so does not prejudice any other beneficiary. File a copy of the final accounting with the court once all debts have been paid and all the estate's assets have been distributed. Along with the final accounting, the personal representative should file a petition to settle and allow. This petition asks the court to review the accounting, ensure the estate's business is complete and close the estate, which ends probate. What Are the Duties of an Executor of a Will in Illinois? When a will is probated in Georgia, it goes to the probate court, which checks whether the will is valid and oversees the distribution of the deceased person's property according to the will. The executor of a Georgia will may work directly with the probate court to probate the will, or may hire an attorney at the estate's expense to help him probate the will.